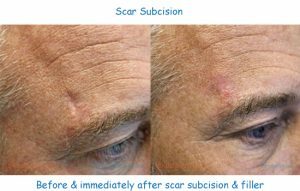 Anyone with visible scars knows how debilitating they can be but with the technology & expertise found at Skinspirations, at least most scars can be improved. The staff at Skinspirations uses a combination of methods, depending on the type of scar, including lasers, light devices, microneedling, subcision (loosening the fibers under the skin that pull a scar inward) and medication injections. These treatments can improve the appearance of scars by up to 95%, depending on the type of scar. How do you know what treatment is best for your scars. Answer the following questions and we'll give you our experienced opinions. Does a depressed scar look smooth when stretched to the sides? If the scar looks smooth when you stretch the skin on either side of it outwards, then the indentation is due to scar tissue under the surface that's pulling the skin inward, and even aggressive surface treatments like laser resurfacing, won't correct the scar's appearance. Scars that are improved with traction of the skin like this are usually rolling acne scars and some surgical scars. 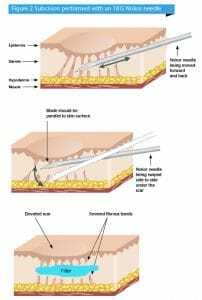 Subcision is the term used for the procedure of cutting the strands of fibrotic scar tissue that tether the surface skin down onto the underlying tissue. A thin needle or special blunt-tipped instrument is inserted under the scar, and then moved back and forth, until no more resistance is felt with insertion and all of the deep scar fibers are cut. When all of the deep scar strands are released, the scar will appear flat at the surface, and as it looked originally when the skin on the sides of it were pulled outwards. Because blood acts like glue under the skin, and bleeding with injections is unavoidable, a dermal filler is injected as the scar tethers are released to keepe the skin & underlying tissue separate. 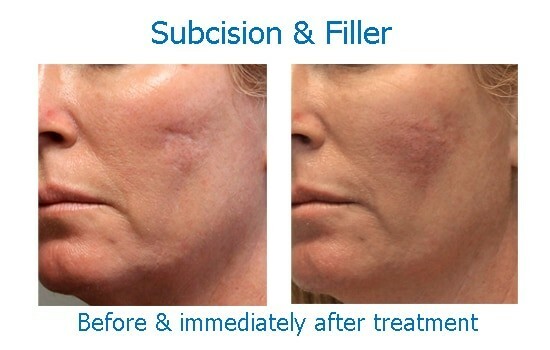 In most cases, only two or three treatments of subcision with temporary dermal filler are needed to produce a permanent improvement in these types of scars. Does the scar look indented even when the skin on each side is stretched outwards? 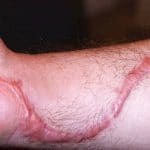 Scars that do not appear improved by stretching them apart, like ice pick, boxcar, surgical and some chicken pox scars, are due to defects in the surface of the skin, so they need a procedure that treats the skin's surface. These scars won't be improved by treatments under the skin's surface like subcision and/or dermal fillers. 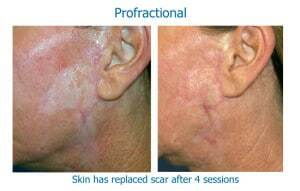 Depending on the type of defect, these superficial scars can usually be improved by using fractionated lasers. Fractionated ablative lasers, like our Profractional, remove and replace a fraction of the scar tissue with normal, new soft skin. Since only a percentage of the scars can be replaced by new skin with each treatment, it may take several sessions to produce significantly visible results, but most people see an average of about twenty percent improvement in their boxcar or ice pick scars with each Profractional laser treatment. Another treatment to help improve surface scars, and with only one day of social downtime, is microneedling. Our painless SkinPen microneedling device produces thousands of tiny holes in the scar, each which is also replaced with normal, soft skin. Best results are seen with a series of treatments. Is the scar thicker & elevated above the level of the surrounding skin? 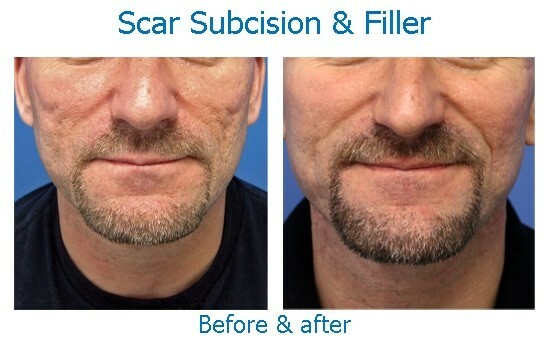 Scars can sometimes thicken and become raised, especially when located in areas of friction or pull, like over a joint. Other risk factors for forming hypertrophic or keloid scars are darker skin types, age under thirty, deep burns. When the scars are elevated more than a couple of millimeters above the surrounding skin, a series of injections of a medication called 5-fluorouracil (5-FU) with or without a steroid medication, will help to flatten them. Surprisingly, a small amount of Botox injected around the perimeter of the scar will also help reduce the size of the scar. If the scar is only slightly elevated or has been flattened previously with injections, painting on a solution of 5-FU during a Profractional laser treatment will help both with improving the texture and flattening the scar further. Is the color of the scar different from the surrounding normal skin color? It isn't uncommon for the color of a scar to be either darker (hyperpigmented) or lighter (hypopigmented) than the surrounding skin, or remain reddened for long periods. Hyperpigmentation or persistent redness can make scars more noticeable and often, improving the color makes the scar itself almost imperceptible. Hyperpigmentation can usually be improved with prescription skin products, IPL treatments, and/or chemical peels. Persistant redness usually responds well to IPL treatments. Hypopigmentation is more difficult to improve but fractionated ablative lasers like our ProFractional are sometimes successful in restoring normal color where the pigment had been lost. Many people with acne scars have a combination of boxcar, rolling and ice pick scars, so they may need a combination of treatment types to see overall improvement. We commonly combine several treatment modes in a single session and determine pricing based on the time that the treatment/s require. If you'd like our opinion on the best strategy for your scars, contact us for a complimentary consultation by registering online here or by calling 727-571-1923.